Thanks! It’s not exactly the same, but I’m going to get it and see what he says about it. We have been looking for this blue duck for over two years and have almost given up hope. He used to have a sheer blue ribbon around his neck. He’s about 14″ tall. I started looking for Blue Duck’s replacement when I tried to give our son Aidan a yellow duck for Easter to replace Blue Duck two years ago. Aidan was very grateful to have gotten Blue Duck’s brother, and then promptly proceeded to put him next to Blue Duck. No luck with replacing Blue Duck’s affections. I renewed my efforts when a week ago, our son woke up crying in the middle of the night, because he couldn’t find Blue Duck. It was just tangled in the blankets, but it got me to thinking about the heartbreak he would go through should be ever lose this lovie. This duck was given to him by his great grandmother and we can barely get it away from him to get it washed. I’m sure she got it at the local drugstore where things like this are sold for Easter baskets. I’ve scoured the stores every Easter to find this stuffed duck, but to no avail. So I hope that someone out there can help us to find him. It would be a disaster of major proportions at our house for Aidan if he doesn’t have Blue Duck. 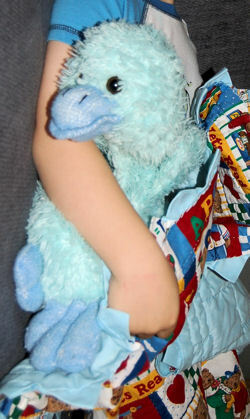 If you can help Ngan find this Large Blue Chenille Duck, THIS SITE IS NO LONGER ACTIVELY MANAGED. Please use Our FREE FACEBOOK GROUP, including #090708-1 in the subject, . I have emailed Ngan. Thanks again Tami!! I’m sorry I haven’t responded to this sooner. And our son is okay with the blue duck. Thanks so much for all your help. The duck is too small. Thanks so much for continuing to look for this little guy.